Pavtube MXF Converter for Mac is rated No.1 in now converter markets, this software performs best in our MXF converter review test. This software has brief main interface but powerful feature, it can convert MXF videos recorded by Canon, Sony, Panasonic, JVC, Blackmagic, etc. camcorders, nearly all kinds of MXF videos are well supported, it will help you to convert any SD/HD/4K MXF format to MP4, AVI, MKV, MOV, MPG, FLV, WMV or other formats. 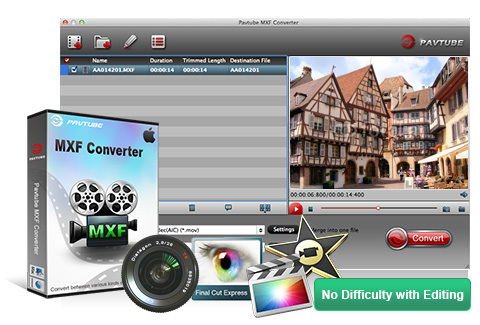 The most important part is this Pavtube MXF Converter for Mac has optimized formats for editing software and players, like Apple ProRes 422/4444 codec for FCP X, Apple InterMediate Codec for iMovie, DNxHD codec for Avid Media Composer, MOV for QuickTime, and smoothly playable formats for HDTVs, include Samsung Smart TV, Panasonic Smart TV, Sony Bravia TV, etc. Support: macOS 10.12 Sierra, 10.11 El Capitan, 10.10 Yosemite, 10.9 Mavericks, 10.8 Mountain Lion, 10.7 Lion and 10.6 Snow Leopard. With Pavtube MXF Converter for Mac, you can convert MXF video shot by Panasonic P2/Canon XF/Sony XDCAM camcorders to all the formats you need, such as MP4, WMV, MKV, AVI, FLV, MPG, 3GP, MOV, H.265 etc. it can encode MXF files in full 1080p HD quality. Besides, it can extract audio from MXF recordings, and then convert to MP3, WAV, WMA, AAC, AC3, AIFF, AU, FLAC, OGG, M4A audio formats. Have problems to import and edit MXF with editing software on Mac? Pavtube MXF Converter for Mac can help you. With this powerful Windows MXF file converter, you can convert MXF to video formats that supported by various editing software, including FCP X, FCP 7, FCP 6, Adobe Premiere Pro, Sony Vegas Pro, Avid Media Composer, DaVinci Resolve, iMovie, FCE, Windows Movie Maker, Pinnacle Studio, Cyberlink PowerDirector, VirtualDub etc. After converting MXF to supported formats, you won’t have video compatibility problems. With Pavtube MXF Converter for Mac, you can do easy editing with your MXF videos. This MXF Converter enables you to trim, crop the video, or convert 2D MXF to 3D, add text/image watermark and define the text color, and merge several MXF videos into one file. Besides, you can adjust the video brightness, contrast, volume, saturation, etc. it is available to load subtitle to the video or replace/remove audio from MXF video. You can load batch MXF files to this best MXF conversion program and convert them simultaneously. You can also preview the MXF files in the window before convert, with the built-in player, you can play MXF videos in full screen, it can also help you to capture the favorite image when you are previewing. Pavtube MXF Converter for Mac also supports previewing the original and output video effect at the same time when editing the video file. Pavtube MXF Converter for Mac upgraded to support converting video to H.265. You can convert your different video files like MXF, MTS, WMV, AVI, MP4, FLV, MOV, M4V, MKV, MPEG, MPG, VOB, AVCHD, XAVC/XAVC S and others video files to H.265/HEVC format since it’s the best format for video experience. Can FCP X Accept Avid MXF Files on Mac?